Product was provided by Nintendo. 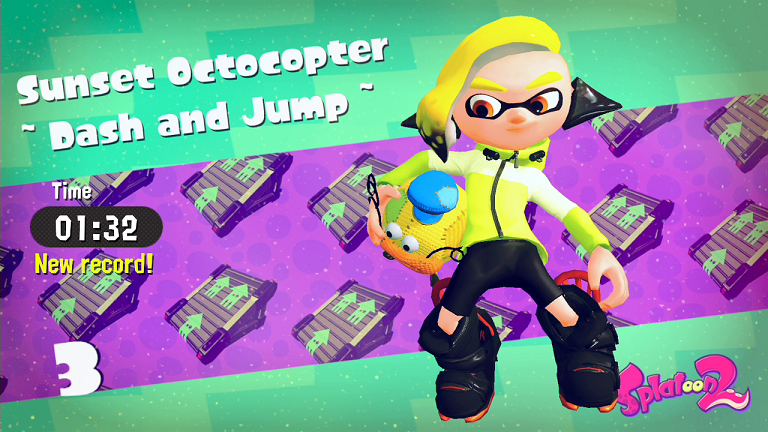 Much of the focus when talking about Splatoon always ends up landing on the multiplayer portion of the game. That makes sense, considering it is the game's most advertised point and it's what you spend the most time playing after finishing the single-player campaign. 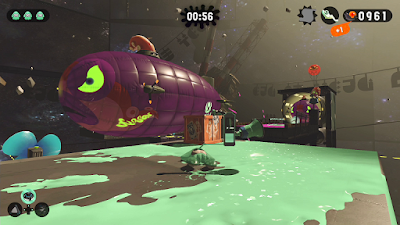 But unlike most online multiplayer-centric games these days, Splatoon, and now Splatoon 2, have as well designed of a single-player experience as one would come to expect from any offline Nintendo game. I was blown away by how well the gameplay of inking surfaces for movement combined with shooting for a unique action platforming experience in the first game, and after a few worlds of Splatoon 2's single-player adventure, I'm loving it all over again. Shooting one of these targets causes objects to move. 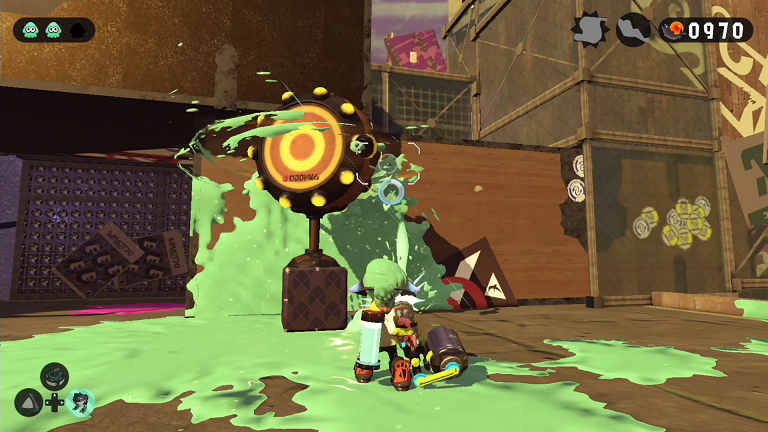 Splatoon 2's Octo Canyon mode is arranged much like the first game's Octo Valley. Several hub areas house a handful of levels each which must be cleared before that world's boss stage becomes available. Even the hubs are like small levels though, as each stage entrance is initially hidden and often requires you to perform some platforming and exploration before shooting and revealing the entrance. This time, Marie, the celebrity squid from the first game, helps you on your quest by dropping the knowledge on all the new weapon types and their new functionality (for example, flinging ink in a narrower, vertically oriented line when jumping with a Roller, or using the new Dualies' dodge roll to instantly activate and ride a grind rail). 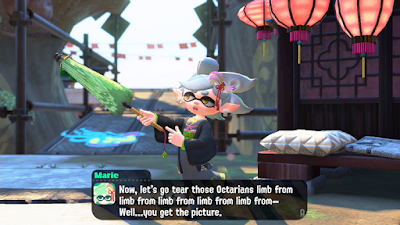 Her and other characters' dialogue is also pretty darn amusing, so that's another plus. Nearly every level I've played so far introduces new gameplay elements that weren't present in the first game (and a few that were) and then expertly builds on the concept with more complex level design as you progress. To give a few examples, the first game's "Inkrails" have been upgraded to Grind Rails, which allow for shooting, swimming, jumping, and bombing while riding them. There are "Grapplinks", glowing orbs which warp you to them when shot. Also, "Inkfurlers", which extend like party noisemakers when shot with ink, creating a temporary path and mowing down enemies along the way. And these are just a few examples from the first few chapters of Octo Canyon. Speaking of speedrunning, your fastest time on each level, along with which weapon you used to achieve it, is also tracked on the stats menu. At the point I'm at, there's not really any incentive for speedrunning stages, or any online leaderboard for times, but something about seeing that "New Record" pop up really makes me want to go back and play everything faster. Now if only there was an update to have the timer show fractions of seconds and keep records for each weapon on each level... please? Update: The mobile app shows your best times per weapon per level! !